کاظمی, ملیحه السادات, قاسم العسکری, محمد کمال, جواهریان, عبدالرحیم. (769). مد‌ل‌سازی لرزه‌ای محیط‌های همسانگرد صوتی و صوتی گرانرو در حیطه tau-p. مجله ژئوفیزیک ایران, 3(1), 33-43. ملیحه السادات کاظمی; محمد کمال قاسم العسکری; عبدالرحیم جواهریان. "مد‌ل‌سازی لرزه‌ای محیط‌های همسانگرد صوتی و صوتی گرانرو در حیطه tau-p". 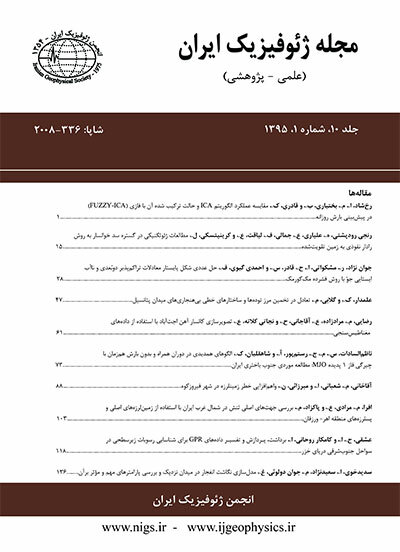 مجله ژئوفیزیک ایران, 3, 1, 769, 33-43. کاظمی, ملیحه السادات, قاسم العسکری, محمد کمال, جواهریان, عبدالرحیم. (769). 'مد‌ل‌سازی لرزه‌ای محیط‌های همسانگرد صوتی و صوتی گرانرو در حیطه tau-p', مجله ژئوفیزیک ایران, 3(1), pp. 33-43. کاظمی, ملیحه السادات, قاسم العسکری, محمد کمال, جواهریان, عبدالرحیم. مد‌ل‌سازی لرزه‌ای محیط‌های همسانگرد صوتی و صوتی گرانرو در حیطه tau-p. مجله ژئوفیزیک ایران, 769; 3(1): 33-43. امواج صوتی که در محیط‌های گازی و یا سیال‌های گرانرو کاملاً میرا نیستند در مقایسه با امواج کشسان حساسیت بیشتری دارند. بدان معنا که حساسیت و قدرت آشکارسازی امواج صوتی نسبت به امواج کشسان در اینگونه محیط‌‌‌ها بیشتر است. از طرف دیگر توصیف مخازن هیدروکربوری با روش‌های پردازش داده‌های لرزه‌ای و وارون‌سازی داده‌های لرزه‌ا‌ی براساس معادله‌های امواج صوتی استوار است. در این تحقیق به تحلیل داده‌های لرزه‌ا‌ی و مدل‌سازی محیط‌های متفاوت برای دو چاه در یکی از میدان‌های جنوب ایران و ناحیه مخزنی آن پرداخته شده ‌است. سپس مدل‌ها با زمان بازتابی و تغییرات دامنه امواج لرزه‌ای قائم VSP درحیطه tau-p مقایسه شده‌اند تا تاثیر ناحیه گازی روی داده‌های لرزه‌ای بهتر مشخص شود. با این روش مشخص شده ‌است که ناحیه گازی می‌‌تواند تاثیر زیادی روی امواج صوتی بگذارد. ضمناً روشن شده ‌است که امواج صوتی گرانرو در ناحیه گازی مخزن تطابق بهتری با داده‌ها دارند. Acoustic waves propagated in gas and lossy media are less attenuated and more reliable than elastic waves. Accordingly, the detection and measurement of acoustic waves are more precise than for elastic waves. Consequently, reservoir characterization using processing techniques and seismic data inversion are based on propagations of acoustic waves. The wave field in acoustic media is described by a scalar quantity rather than by a vector. The tau-p transformations in the near field for the acoustic and elastic wave equations are similar, as they both yield the eikonal equation in isotropic media. The reflection and transmission behaviors of waves, however, differ considerably in each of the two media. In acoustic media, all P-wave energy is conserved and as a result it can be used for near offset tau-p modeling. Fryer (1980) developed a reflection method for modeling the VSP data in tau-p domain. The main idea of using tau-p domain is to investigate the amplitude variations as a function of near offset, changes of phase, estimation of attenuation factor (1/Q) and separation of primary multiples. Laboratory measurements and well log data have shown that the Q factor depends on the type of media and also the percentage of saturation. Therefore, Q is a very strong factor for characterization of reservoir gas zones. Due to its sensitivity, this factor is used in our two different modeling programs. In this study, the VSP modeling was used in the t-x and the tau-p domains. One of the most important parameters in this modeling is the velocity model. To generate the velocity model and synthetic seismograms, a computer program was developed in t-x and tau-p domains. Then, for two exploration wells, the VSP models were compared using real data. Based on the above algorithm, a software package was developed using a finite difference method in the tau-p domain. The slowness-time reflectivity method was used to calculate tau-p synthetic seismograms with the inclusion of the attenuation factor (1/Q) in lossy media. For large acoustic impedance contrasts, the attenuation factor occurs as an amplitude decay and phase rotation for some range of high frequencies. First, the upcoming and downgoing VSP synthetic data for side locations along each well were modeled and compared with the VSP real data. Second, the normal incident seismic sections based on well logs were compared with the tau-p sections derived from the acoustic and viscoacoustic media. The VSP data and seismic modeling techniques were used for the detection of gas zones in two wells in one of the south Iranian reservoir. The models of traveltime and amplitude changes of VSP data in the tau-p and in the t-x domains proved to be effective techniques for detection of gas zones from the VSP seismic data. Using this technique, gas zones in the reservoir can be very reliably detected using acoustic waves. The aforementioned procedure were applied in verification of different media. A comparison of the VSP data generated in the tau-p and the t-x procedures can yield valuable results. Results show that modeling in the tau-p domain using a localized slant stack is faster and more reliable than are conventional methods. Additionally, wave energy characteristics and amplitude changes of seismic waves in two different acoustic and viscoacoustic media were investigated using a 2D acoustic wave algorithm in lossy media. By using acoustic, viscoacoustic and anisotropic models in the tau-p domain and comparing them with normal reflections and VSP data, one can detect saturated gas zones. The synthetic VSP in the tau-p domain definitely helped to verify changes in amplitudes and phases in two VSP well data sets investigated here. Using this technique, it was found that reservoir gas zone can be reliably detected by acoustic waves. Furthermore, it was established that these waves can be used for better comparison with real VSP data in the reservoir gas zones.